We use a lot of hand soaps in my house hold. I am constantly washing my hands. I think we use about 1-2 hand soap pumps in a month. My favourite type of hand soaps are the foaming ones. I have noticed my daughters prefer the foaming hand soaps too. I especially like to use the scented ones because they will leave a scent on my little ones hands. Then I will inspect them to see if they washed their hands with soap by taking a sniff of their hands. 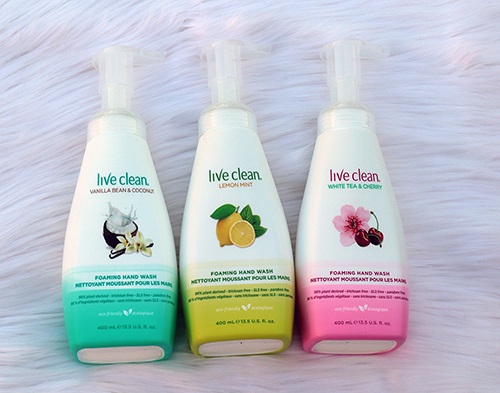 I am in love with Live Clean's new foaming hand washes. I really like the white tea and cherry. It leaves my hands with a nice floral scent. The foaming hand soaps are gentle and it does an amazing job of cleaning my hands. It also comes in Vanilla Bean and Coconut & Lemon Mint which are equally amazing. I kept one Live Clean's foaming hand soap in the kitchen. My hands were so greasy from touching some cooked chicken. At first I wasn't sure it could get the grease off my hands but it did. I used about 3 pumps and my hands were grease free. These hand soaps are a must have for your bathroom and kitchen counters. Live Clean would like to offer one of my readers to win the Live Clean’s three new Foaming Hand Washes. This giveaway will run from August 5th to September 2nd, 2018 (midnight EST). Winners, you have 72 hours to reply. You must be 18+ Canadians Only. Good Luck! Psst - Can't win if you don't answer the mandatory question. I am not responsible for shipping and handling or damages of the prize. The prize is shipped by the Sponsor and they may substitute the prize depending what is in stock. Your information will be sent to the Sponsor for the purpose of shipping out the prize. Ontario I would like to try the handwashing soap. From Ontario and would like to try their apple cider clarifying shampoo. Would be nice to try before I buy!! Thank you for the chance! I would like ti try Nourishing Night Cream, I am in New Brunswick. Thanks for the contest. I would love to try Exotic Nectar Argan Oil restorative shampoo and the conditioner. Have never tried any of these as of yet. I would like to try the FRESH FACE HYDRATING CREAMY CLEANSER. I'm in Newfoundland.I would love to try Exotic Nectar Argan Oil restorative shampoo and the conditioner. I'm in Ontario and would like to try the Nourishing Night Cream. I'd like to try the Exotic vitality monoi oil calming body wash. I Live in the Yukon and I would also like to try the dead sea salts. I am in Ontario and would like to try the FRESH FACE 24 HOUR HYDRATING DAY CREAM. I'm in Ontario and I'd try the Argan Oil. I live in Sk. and I would like to try the FRESH FACE SOOTHING DAILY MOISTURIZER. I live in NB and would love to try the SPA THERAPY SOOTHING DEAD SEA SALTS. I am from Ontario and would love to try the FRESH FACE NOURISHING NIGHT CREAM. I’m in Alberta. I would like to try the Vanilla Oatmeal Soothing Body Wash. I'm in Ontario and I'd like to try the apple cider clarifying shampoo. I'm in Ontario and I would love to try the Fresh Water Hydrating Body lotion. I'm from Quebec and I would like to try the Fresh face soothing daily moisturizer. I'm in Ontario. I've never tried the Live-Clean shampoo and would love to know what it's like. I am in BC and I would love to try the Live Clean apple cider clarifying shampoo. I am in Ontario. I would like to try the Fresh Face Nourishing Night Cream. I live in Ontario. I’d love to try the Fresh Face Daily Moisturizer. I live in ontario and would love tontry the foaming hand soap! Thankyou for doing such great giveaways!! I am in Ontario. I'd also like to try the Pink Fire colour protect shampoo and conditioner. I'm from Ontario and want to try the spa therapy mango body wash. I am from Alberta. I would like to try the EXOTIC VITALITY MONOI OIL CALMING BODY WASH. The Live Clean Fresh Face would be lovely to try. I'm from Ontario.